You'll be £30.00 closer to your next £10.00 credit when you purchase London: Bombed, Blitzed and Blown Up. What's this? When it comes to being bombed, London is unique. Although it cannot claim to be the most bombed capital city in terms of the weight of explosive detonated it has endured the most varied and unrelenting attack since the discovery of explosives. From the first Irish Republican bomb in 1867, London and its population have been under almost constant assault. Terrorism features in virtually every decade from the 1860s to the present and has caused much damage, particularly during the late 1980s and early 1990s. However, by far the greatest destruction was from the air. The Zeppelin and Gotha bomber raids in the First World War being but a foretaste of what would happen in the Second. Then the capital was devastated, firstly by the Luftwaffe’s aeroplanes and then Hitler’s ‘vengeance’ weapons, the V-1s and V-2s. After the Second World War the bombers returned, in the form of the IRA and then the home-grown terrorists of 2005. Written by a former Explosives Officer who worked for the Counter Terrorism Command of the Metropolitan Police, this is the most comprehensive and record of Britain’s capital under attack that has ever been compiled. For those interested in the individual human aspects and the technicalities this is an excellent read. The book can go into depth in terms of detail, giving plenty of information about explosives used in particular incidents and the effect of them on those unfortunate enough to be in the area where bombs were detonated. Don't be put off by this level of detail, though. Although there are plenty of statistics and nitty-gritty, underneath are fascinating stories of a city under attack, of those killed or injured by those attacks - and of those whose jobs it had been to deal with the aftermath of terror. From the moment i started reading it, i found it hard to put down with over 500 pages of facts and stories, many have never been explained before like the Silvertown explosion or that Wealdstone a suburb of Harrow had the first German night bombing raid in WW2. For anyone fascinated with history this is the book for you covering 1867 up to 2007. When most people talk about London being bombed, they are talking about the German terror attacks of WWII, but London has a unique history of being bombed from 1867. The author has produced a very readable account of this long history of bomb attacks on Londoners. It is a truly comprehensive account that considers the impact on one of the world’s greatest cities, much recommended. 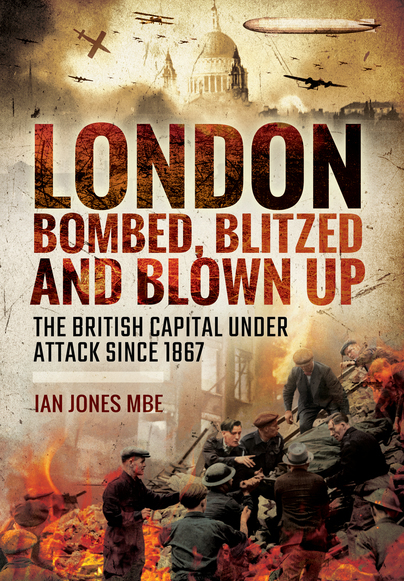 One can only be amazed at the amount of bombing that London has suffered through the years in this terrific history of our capital city by Jan Jones. Some of the bombings are obvious, such as those endured during the blitz and during the "troubles". Others are less well known. Amazing. The author is to be congratulated for his extensive research and for writing the story of the courage of the Metropolitan Police be they warranted officers or members of the civil staff such as the explosives officers. A man who obviously recognises the skills, pressures and cool courage required to deal with explosives and explosive incidents has written an unforgettable book.